This is the first entry for a monthly series about artists, writers and thinkers who have had an impact on me at some time in my life. This starts with the cover of Richard Dawkins The Selfish Gene (1976) because of the cover the book stood out amongst the rest of the books on my father’s bookshelf. I was eleven years old; I liked the colours and the biomorphic creatures. The cover is a reproduction of a painting by Desmond Morris “The Expectant Valley”, 1972. The painting is a of colourful biomorphic creatures on a strange verdant landscape. The largest of these creatures has a large red body and with a purple head of four soft antlers and a black curl; as a child I identified this as the central character of the narrative. It is like the paintings of Miro; Morris exhibited with Miro in 1950 at the London Gallery in an exhibition organized by the Belgian Surrealist Edouard Mesens. 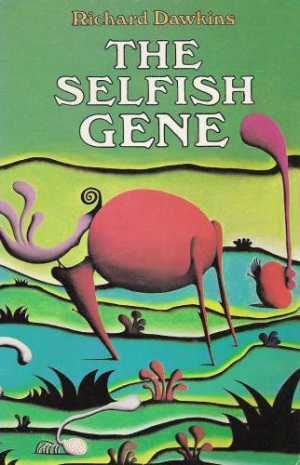 I really liked the cover of The Selfish Gene and as a child expected that the book would contain a story about these biomorphic creatures on the cover. I was disappointed to find that there were no more images inside the book. In a way Morris’s biomorphic creatures are the perfect illustration for The Selfish Gene and Morris has painted a picture based on Dawkins’ book The Blind Watchmaker, 1986. Richard Dawkins owns “The Expectant Valley” and another painting by Morris, “The Titillator”. David Attenborough also owns a couple of Morris’s paintings – none of Morris’s paintings are in public collections. Surrealism was slow to catch on in Anglophone countries and the British Surrealists have largely been ignored in even histories of Surrealism. Desmond Morris was part of the Birmingham Surrealists along with Conroy Maddox, Oscar Mellor, Emmy Bridgwater, John Melville and William Gear. The interest in Surrealism by eminent British scientists (Morris, Dawkins and Attenborough) continues to renew my interest in the art and philosophy of Surrealism. Surrealism was profoundly influenced by the sciences (physics and biology) in more ways than any of the other modern art movements. Desmond Morris never really decided between a career as an artist, as a scientist, a science writer or a television presenter. Morris even managed to combine his interests studying and exhibiting “picture-making behaviour of the great apes”. This diversity of activities makes Morris an interesting person – his new publication The Evolution of Art will include image-recognition technology that will allow readers to see animations and other extra content. Morris’s painting “The Expectant Valley” was one my earliest taste of Surrealism; I will following up my interest in Surrealism in other posts about persons of interest. Following up on my interest in his painting I read Desmond Morris’s books, The Secret Surrealist (Phaidon, Oxford, 1987), The Naked Ape (1967) and Peoplewatching (1978) and this is why I am recommending Desmond Morris as a person of interest. This entry was posted on Tuesday, January 29th, 2013 at 1:47 PM	and tagged with biomorphs, Desmond Morris, Miro, Richard Dawkins, surrealism, Surrealists and posted in Art History. You can follow any responses to this entry through the RSS 2.0 feed. Desmond Morris is indeed an interesting thinker and an original. So thanks for your expressed views and insight into how and when he registered into your consciousness. Tried to follow your lead on the forthcoming book by Morris, titled ‘ The Evolution of Art’. However, a general search couldn’t locate when and the possible publisher. Could you please give more information. Always enjoy reading your writings.